With Christmas fast approaching, I thought it might be nice to take a break from our forensic analysis of the Life and Times of Marie Antoinette and focus on an even more pleasing pastime: shopping! Besides sharing a birthday and a slew of other characteristics, my beloved Reine and I also share a passion for purchasing, a spirit for spending, a zeal for zee sales! ...Though, if you want something a little more like the original, you could commission Global Wholesale Art to make an oil-paint reproduction of a Marie Antoinette painting. For $229.00 you could own a 20x24 reproduction of Jean-Baptiste Gautier-Dagoty's Marie Antoinette, Queen of France. Each day, she dipped in a tub laced with a confection of blanched sweet almonds, pine nuts, linseed, marshmallow root and lily bulb, then rubbed her body clean with a sachet of bran. Feydeau knows a thing or two about L'Odeur de la Reine. Several years ago, while conducting research for A Scented Palace, she stumbled upon a forgotten treasure: the recipe for Marie Antoinette's personal scent. In musty, dusty box in a French archive, Feydeau found a centuries-old document containing the precise ingredients used in making Marie Antoinette's perfume. 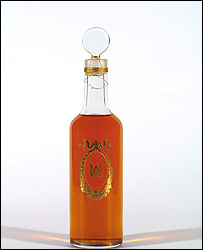 The formula was given to Francis Kurkdijan, one of France's premier perfumers (It's rumored his nose is insured for millions of dollars), who then painstakingly recreated Marie Antoinette's perfume. Sillage de la Reine - "In the Wake of the Queen" -- was created using the essences of amber, jasmine, orange blossom, tuberose, iris, cedar and sandalwood. The deluxe version is sold in numbered Baccarat crystal flasks and cost over $10,000. What's that? You say $10,000 is a bit too steep for your Santa? Don't cross it off your Wish List just yet! There's a bourgeois version for sale at the Chateau de Versailles gift shop for only $450.00. If you pinch a few dollars out of your grocery budget, you should be able to treat yourself to a bottle for Christmas. Who needs bread anyway? Speaking of Baccarat - Christie's Auction House is currently offering a Baccarat Cut-Glass sulphide portrait plaque of Marie Antoinette for auction. This stunning cut glass portrait dates from 1820, has a verifiable provenance, and was once one part of the Cameo Incrustation: The Great Sulphide Show Exhibit at The Corning Museum of Glass in New York. Estimated value: $2,500. Start the bidding, please. And Speaking of Bread - Marie Antoinette was a finicky eater. According to Madame Campan, her first lady in waiting, "She usually ate nothing but roast or boiled poultry and drank nothing but water." However, our girl was not a picky partaker of the pastry. In fact, she was more than fond of croissants and cream puffs. This Christmas, why not treat yourself to one of Marie Antoinette's favorites: bourbon-filled eclairs from Stohrer Patisserie? Sure, you have to book and buy airline tickets to Paris and then navigate yourself around the narrow wrens of the 2nd arrondissement, but take it from this pastry-loving, Marie Antoinette devotee, they're worth the trip! 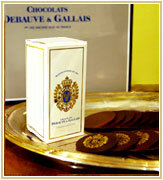 I'd Rather Eat Chocolate - As long as you are in Paris, why not pop over to Debauve and Gallais for some Pistoles de Marie Antoinette? These chocolate coins were originally developed for the queen so that she might disguise the bitter taste of her medicinal powders. A 1.7 pound box only costs $200.00. A Delicious Spot of Tea - Let's face it, in today's economy, which is sagging more than Louis XVI's aging Aunt Adélaïde's physique, who can afford a two hundred dollar box of chocolates? When one can't manage the cost of chocolate, one takes tea, dear. I'll bet I know what you're thinking? But Madam Leah Marie, Antoinette drank hot chocolate made with orange water, not tea! And you would be correct, oh wise follower, but I think we can make one tiny exception for the Marie Antoinette Tea from Debauve and Gallais. 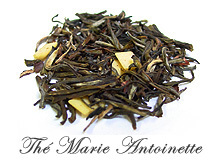 Infused with some of Antoinette's favorite flavors, including chocolate, this tea is so delicious it might even make the Brits believers in the brilliance of the Bourbons! Only $15 for 2.5 ounces of tea in an adorable little apothecary inspired bottle! Let Them Eat Cupcakes for Christmas - I have amassed "rawther" impressive collection of greeting cards featuring Marie Antoinette. 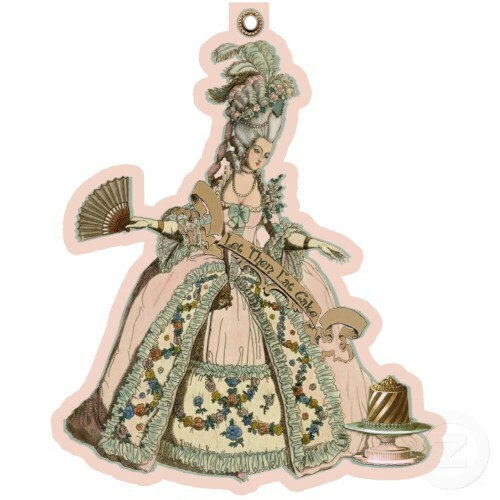 Just when I thought I had seen them all, I found the most adorable Marie Antoinette Christmas Cards produced by Graphic Designer, Paulette Kinney. Speaking of Cupcakes - Once you've flown to Paris and purchased your Stohrer pastries and your Debauve and Gallias chocolates, you will need dessert plates on which to serve them. 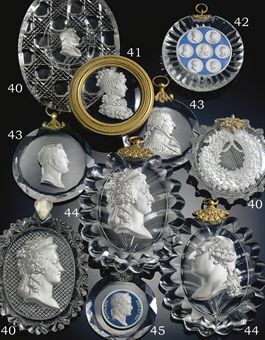 These precious little pastry plates bearing the Queen's likeness are fit for a princess. Go ahead, indulge! Only the Best China Will Due, Darling - If the Rosanna Dessert Plates are too provincial, too bourgeois, perhaps you would prefer pretty porcelain produced by the luxurious Limoges factory. The Boutiques de Musee de France offers a replica of a cup and saucer that was once part of Marie Antoinette's travel case. 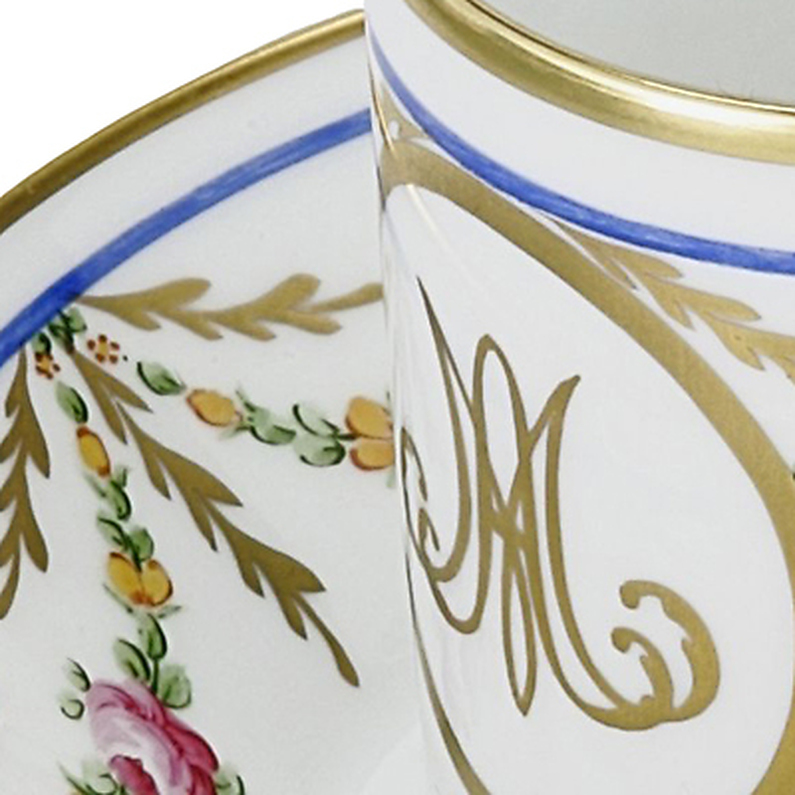 You can have this precious cup and saucer -- emblazoned with the queen's interlocking initials -- for only 95 euros. Squealing Fat Ladies and a Chorus of Nymphs - Once you have acquired the queen's tea and her porcelain from which to quaff it, you will need mood music. Why not listen to the work of Antoinette's favorite composer, Christoph Willibald Gluck. After all, is a tea party really a tea party without squealing fat ladies and a chorus of nymphs? I think not. 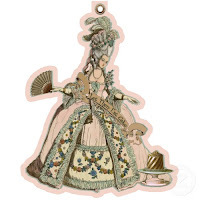 Something to Lose Your Head Over - I realize including a Marie Antoinette action figure with an ejectable head on my blog borders on blasphemy but, frankly, it's just too funny to omit! My son found this toy in a bookstore a few years ago, plunked down his allowance, and presented it to me with a wide, beaming grin that made the Cheshire Cat appear morose. Imagine my son's surprise when my finger hit the button on the back of the doll and her dress and head sprung off. He had no idea we could force mini-Marie to commit hari-kari with the simple touch of a button. Don't worry. No children's psyches were permanently damaged in the acquisition of this toy. Now that my son is a teenager, he thinks this toy is wicked cool. My point is that ever since Marie Antoinette's demise, I have searched in vain for her replacement. Unfortunately, I have not found one that compares. Unsurprising, after all, there was only one Marie Antoinette. If you enjoyed this blog entry, please check back in a few days for 'Tis the Season: Part Deux. In the meantime, may your days be filled with successful shopping and your heart filled with luxurious amounts of love! Merci for this lovely early morning entertainment, I cannot wait for Part Deux! Thank you so much for including not one of my designs but two ! 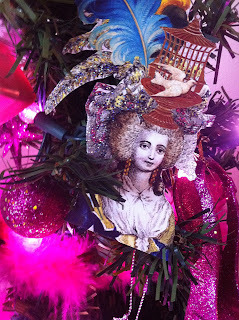 I also design the die-cut glittery Marie ornament gift tags that my clients are buying for their own pink Marie Antoinette Christmas trees. They are so deliciously sweet and come in a collectible gift box! We're using them ourselves on our pink tree here in the Paper Nosh studio. You are quite welcome Paulette! I can't wait to get the LET THEM EAT CUPCAKES cards I ordered! Stephanie! LOL! I am a rebel. Thanks for reading my blog and for leaving comments each time!! Bisous. It`s really interesting to reed. But all thk about other. Why so?